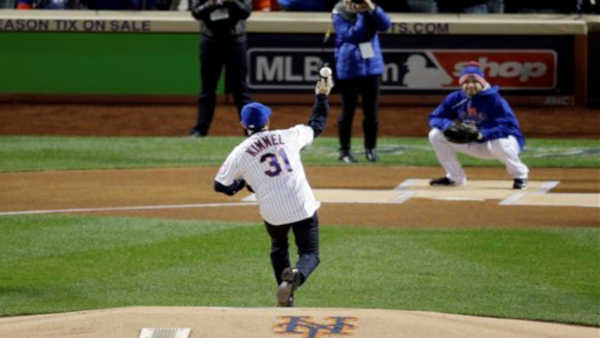 FLUSHING (WABC) -- Brooklyn native and lifelong Mets fan Jimmy Kimmel got the game started out right by throwing out the ceremonial first pitch. "I'm glad I didn't bounce it," Jimmy Kimmel told sports anchor Rob Powers. Kimmel said he was thrilled to be at Citi Field, and excited to bring his late night show back to Brooklyn this week. To see what's in store for Jimmy Kimmel in Brooklyn, CLICK HERE.